Young and spirited Nalendra Anindita has come full circle. 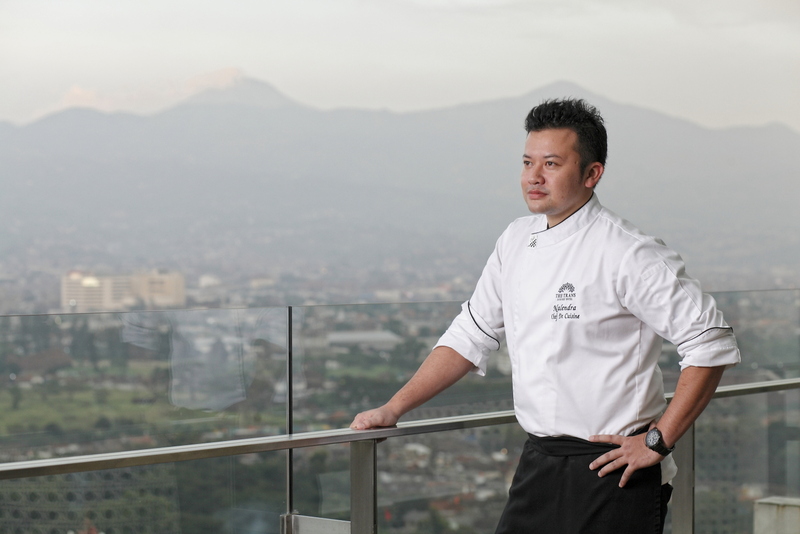 After his tenure in Dubai for several years he is back in his native Bandung and is now the creative power behind the inspired dishes at The Trans Hotel. During our visit there, the chef shared an elegant recipe involving delicious sea bass cooked with a stunning view behind him! 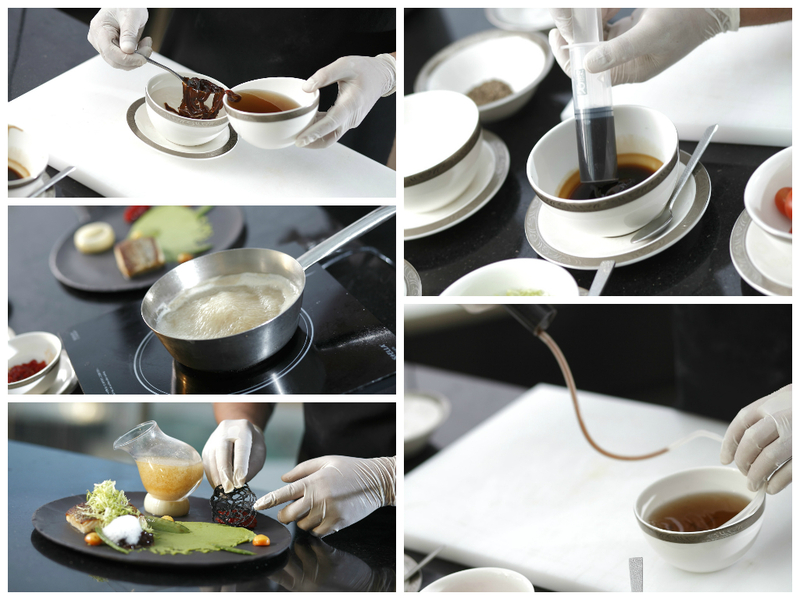 Working in hospitality is something that runs in the family of Chef Nalendra Anindita. Initially, he wanted was to become a doctor, but fate spoke differently and he ultimately decided to follow the footsteps of his father and enrolled at a cookery course at one of Indonesia’s most prominent tourism schools in Bandung. After he graduated, Nalendra started his career modestly at local restaurants and slowly moved to hotels in Jakarta. After two years of experience locally, he finally seized a chance to further his career by working in Dubai and Abu Dhabi. 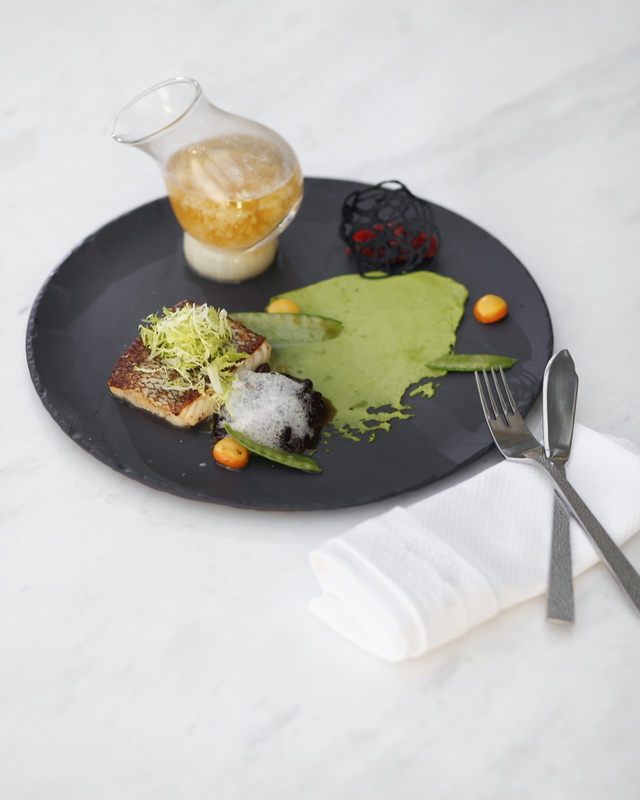 Affectionately called Chef Nal by his coworkers at The Trans Hotel, started a fresh page by working at restaurants at the famed Burj al Arab and Jumeirah Emirates Tower Hotel until he became the Chef de Partie at the Roberto Cavalli Club. “Before I had the chance to work in a five star hotel in the middle of Dubai’s famous F1 circuit and afterwards at Roberto Cavalli’s, I had the experience of hosting VIPs like the owner himself, prominent sheikhs and even US President Bill Clinton,” said Chef Nal. Being a family man, Chef Nal decided to return home after his venture at the Roberto Cavalli. “I went back home to meet my newly born baby and in turn, I started a fascinating career at this hotel,” said Chef Nal about his initial post as Sous Chef with The Trans Hotel. Just within a span of two years, he has been entrusted with bigger responsibilities as chef de cuisine for The 18th Restaurant & Lounge and now as the Executive Sous Chef of the hotel. “To be able to conceptualize and nurture The 18th since the beginning was such a joyous experience, especially watching it grow until now,” Chef Nal confesses. Chef Nal took us to up to The 18th, the highest restaurant in Bandung, and cooked for us a Japanese-influenced sea bass recipe with a modernist touch. Even with its sophisticated look, the recipe is actually a fairly easy one for you all to try at home. So buckle up and enjoy the ride under Chef Nal’s simple guidance. Fillet the whole fish and portion it for 160 gr. Prepare the marination by mixing all the sea bass marination ingredients and bring it to boil then simmer. Set aside the mixture and let it cool down. Once the temperature gets normal, put put in the fish to marinade and leave it for a day. To make the spaghetti, mix all of the ingredients up, strain it all, and put it in the refrigerator overnight. Afterwards, put the liquid into a syringe and press it through a small and elastic straw. Let it rest for about two minutes and then strain it up and rinse by putting the spaghetti on mineral water. Remove the fillet from the marination and put it into the oven for about 13 minutes on 180C. While waiting the fish, blend the mixture of miso foam in a bowl by using a hand blender until it foamy. 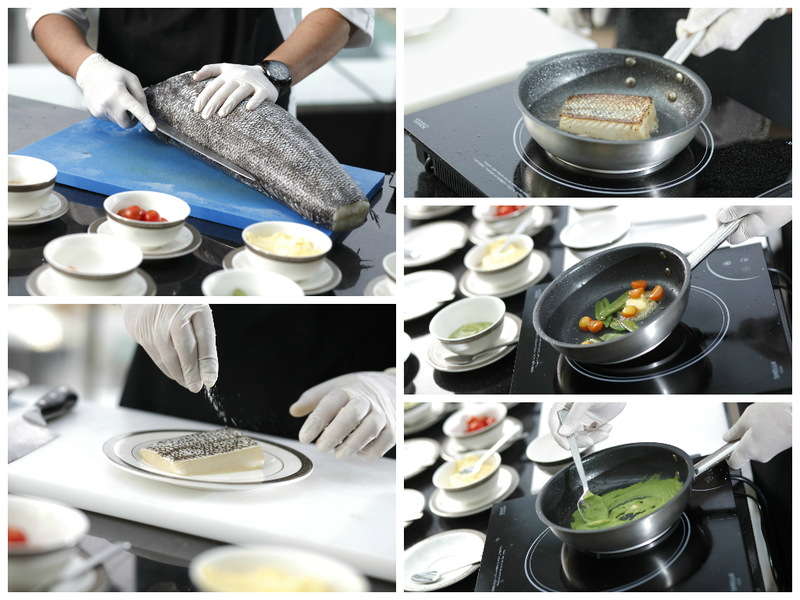 Cook the veloute by using a fish stock as the base and infused with squid ink then thicken with roux (if needed). Plate the fish and garnish it with yellow frisee lettuce, red pepper marmalade, & miso.